On August 10, Troop 1 Meguro held Welcome Party inviting 6 Scouts and 2 leaders of Polish Troop who stayed with our families. The weather has been extremely hot in Tokyo durung this summer but, this evening turned out to be not too hot for our party! Our leaders and Rover Scouts were setting up for the night with National flags of both Poland and Japan. By coincidence, both use the same color, red and white. Despite weekday night, many beaver scouts, cub scouts and their parents also joined his party.President Takane made opening remarks by welcoming Polish Troop members in Japanese and English.The photo is the members who stayed with our familes: 2 unit leaders, 4 boys and 2 girls. The girls were wearing Yukata. Many of thm are tall. They brought us Polish Jamboree promotion goods, coaster and emblem for gifts as they are bidding for 2023 World Scout Jamboree. We all wish that they win.Polish scouts introduced by themselves in English, Wagner consecutively translated. Firstly, Polish team introduced one of their song game and we played together. Japan team also introduced summer song with action, need big action pretending as shooting fitrworks led Hirano Rover Scout. Now , it is time to eat, of course, BBQ.After the meal, take this good opportunity to hold awards Hayabusa. Yoshida Scout was awarded Hayabusa and expressed her feeling about the award. She was asked to do in English as Polish scouts were attending and made her nervous, but made it all right. Hope Polish Scouts also ejnjoyed our party.Tomorrow, August 11, we have fairwell party.Thank you so much for leaders, Rover and Venture Scouts, parents who helped as well as participated. 8 years from now, World Scout Jamboree will be held most likely in Poland. Current Cub Scout generation will have a chance to be a Japan Contingent member to go to Poland then. And you have may see each other again there. So, keep up with Scout activity and take a chance. Leaders of the Polish troop stayed at Tanabe family. They wanted to go to ‘Hard Rock Cafe ‘ in Roppongi so they went and they enjoyed Roppongi by Night. We wondered how they thought about bustle Roppongi night where multi national atmosphere. Also they enjoyed local food such as Sushi and Tempura. Now a days, Japanese cuisene became popular in overseas and not so unusual for foreigners. However, Japanese food in Japan is deffinitely tasty and all scouts visited us enjoyed real Japanese food. International exchange is one of the mosts appealing thing of scout activities together with outdoor activities. Homestay will provide a rare opportunity for us to learn about culture as well as customs of foreign counties. 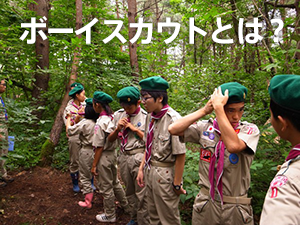 Troop 1 Meguro also sent contingents to overseas Jamboree in the past and welcome by many families overseas. Despite of differences of culture and languages, while we involve in Scout actibities, it gives each othrer comfort and frienfsip.This would be very different from legular homestay.If you have as chance to have a homestay for boyscout, take the opportunity.